The piece today focuses on those engaged in agriculture, fisheries, plantation workforce, domestic workers and migrant workers. They represent essential lines of the food supply, labour and income. Have we ever thought of recognizing the skills they possess by providing certification, giving dignity to their labour and vocations, providing pathways to graduate to higher incomes and positions? The Census and Statistics Department, reports 28.5 per cent of the labour force as working in the agriculture sector - farming. 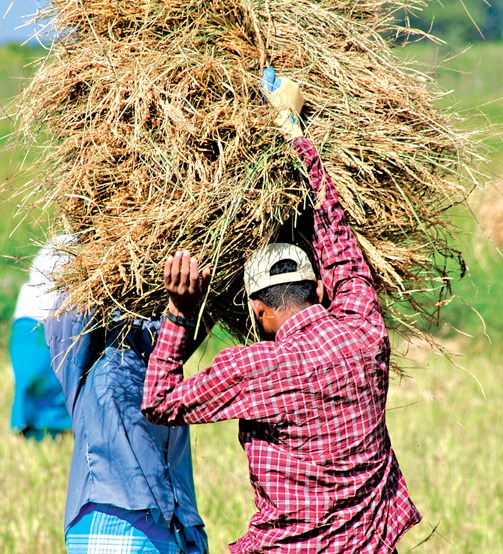 The labour force survey counts as agriculture includes farming what is planted on the ground in terms of paddy, vegetables, fruits, spices, tea, rubber, coconut, etc. It further includes forestry, fishing and livestock farming. * Sri Lanka's total foreign employed workforce stood at 1,189,359 in December 2016. * Over 4 million direct and indirect employment is found as fishermen, breeders, processors, logistics, cold chain, packing and other service suppliers. * Domestic, Live-in maids, Caretakers and private drivers are considered domestic workers. The statistic is not complete but clearly, it represents a significant labour component. We have a significant population in the formal and informal sectors whose competencies acquired on-the-job and home-grown skills can be mapped and certified to reap the benefits of a better skilled and more productive workforce. NVQ 2 is on offer as a right to returnee migrant workers. This should be formalised across all other sectors with competency certification aligning competencies of the informal workforce to the mainstream. Recognition of Prior Learning is one of the key components, whereby informal skills acquired through family trades or gained from life experiences, are assessed and certified based on the standards starting from NVQ 2 set by the National Vocational qualification framework. Training standards- the minimum age of entry into fishermen's training schemes; medical examinations, including chest X-rays and hearing and sight tests, required for persons entering training schemes; the examinations, particularly the hearing and sight tests, may differ for persons entering deck and persons entering engine courses; the level of general education which is required for admission to fishermen's training schemes; fishing, navigation and seamanship, safety, engineering, catering and other subject-matter which should be included in the training curricula; the amount of practical training, including time spent in engineering shops and at sea, which trainees should undergo; the duration of the training courses for the various fishing occupations and the different levels of competency; the nature of any examinations following the completion of the training courses. They should be periodically reviewed and kept up to date with technical developments and should, as appropriate for the functions to be exercised, include training in-- (a) fishing techniques, including where appropriate the operation and care of electronic fish-finding devices, and operation, maintenance and repair of fishing gear;(b) navigation, seamanship and ship handling appropriate to the sea area and to the type of fishing for which the course is designed, including a proper knowledge of the international Regulations for Preventing Collisions at Sea;(c) stowage, cleaning and processing of fish on board;(d) vessel maintenance and other related matters;(e) operation, maintenance and repair of steam or internal combustion (gasoline or diesel) engines or other equipment which the trainee may be called upon to use;(f) operation and care of radio and radar installations which the trainee may be called upon to use;(g) safety at sea and safety in handling fishing gear, including such matters as stability, effects of icing, fire fighting, water-tight integrity, personal safety, gear and machinery safeguards, rigging safety measures, engine-room safety, lifeboat handling, use of inflatable life rafts, first aid and medical care and other related matters;(h) theoretical subjects relevant to fishing, including marine biology and oceanography, which will enable trainees to gain a broad foundation for further instruction and training leading to promotion or to transfer to another fishing occupation or another type of fishing;(i) operation, maintenance and repair of refrigeration systems, fire-fighting equipment, deck and trawling winches and other mechanical equipment of fishing vessels;(j) principles of shipboard electrical power installations, and maintenance and repair of the electrical machinery and equipment of fishing vessels;(k) health and physical education, especially swimming, where training facilities permit;(l) specialised courses in deck, engine and other subjects after an introductory period of general fishing instruction. Plant production- Learners may come from both genders. Provides learners with the opportunity to gain a qualification in plant production. It forms the basis for learners to extend their learning into more specialised areas of plant production and provides the basis of the establishment of sustainable farming operations through the inclusion of a wide spectrum of competencies required by farmers. Whilst technical production orientated competencies are ensured, other aspects such as agri-business and good agricultural practices are included in the range of competencies required by farmers in order to enable them to strive towards agricultural management standards and practices at higher levels. Competent qualifying learners in this qualification will participate in the production of quality agricultural products in plant production whereby enhancing the overall agricultural process and gain opportunities to access local, national and international agricultural markets. Migrant workers- Potential, current and returning migrant workers are often confronted with numerous challenges in the labour market including lack of recognition of their skills and competencies gained abroad or in their country of origin. A returning migrant does not translate into automatic social and labour market integration and returnees may need support for the following services: career counselling; domestic/international labour market information; support for self-employment; recognition of skills and competencies acquired through non-formal and informal learning while abroad. Domestic workers- The skills development and professional recognition play an important role in promoting decent work for domestic workers. Training and certification based on national competency-standards can help raise the status of domestic workers as a recognized profession. This, in turn, would improve domestic workers’ employability and prospects for better employment conditions. Across each of the sectors mentioned, we have very many institutions that can design and deliver certification programmes in this country. A hindrance, for now, is that it falls between the cracks at times given the plethora of Ministries and agencies. Nevertheless, the thought of empowering a crucial component of the labour force to newer heights should inspire many. Ironically it has not been the focus of any political cry in the recent past. Not even from those who reportedly espouse the cause of either the downtrodden masses or peasants and workers!